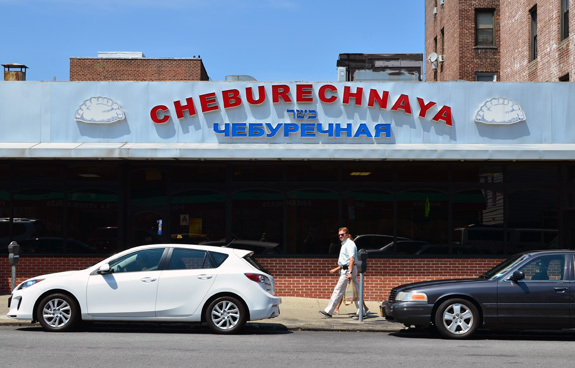 Rego Park, in Queens, is one of the very few places in the western world where you’ll find a high density of Uzbek restaurants, thanks to the sizeable Bukharan Jewish population. As in Brighton Beach, you can choose the amount of cheesiness you want with your meal — from a little, usually in the tacky decor, to a ton, if you choose the Saturday night deluxe banquet at your favorite palace. Cheburechnaya is one of the prominent neighborhood joints that doesn’t come with any kind of live music or other bombastic show. 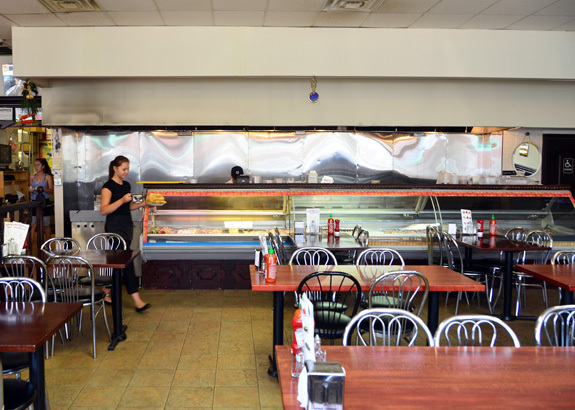 In fact, with its drop ceiling and its long refrigerated window against the wall (which showcases the kebabs), it looks more like a cafeteria. A cafeteria that also serves wine and vodka if you ask nicely. 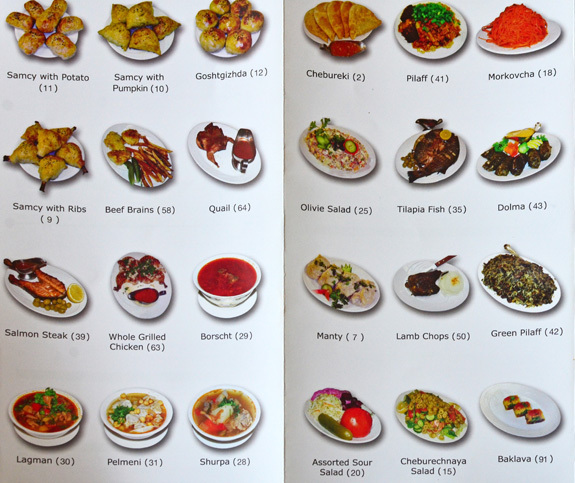 The menu contains nearly every Uzbek dish I’ve ever heard of, and then some. 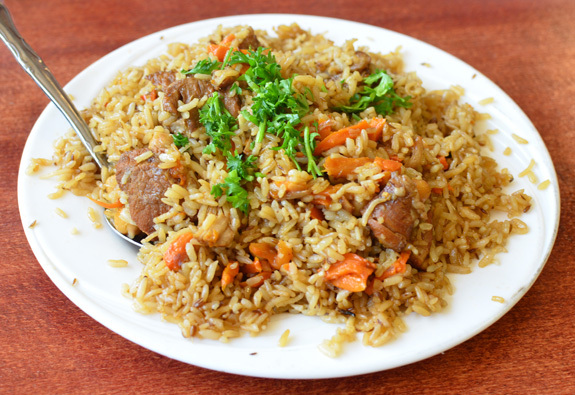 For those of you who aren’t familiar with Uzbek cuisine, that would be various “dough products” — from chebureks to samsas — soups like shurpa or lagman, rice dishes, like the famous plov, and a wide variety of kebabs, including various offals. There are also some salads from a 2,000 mile origin radius (Olivier, “Israeli”, Hummus, Baba ghanoush), and a few fish dishes that look about as Uzbek as me. And if you’re lost, you can always check out the picture menu. 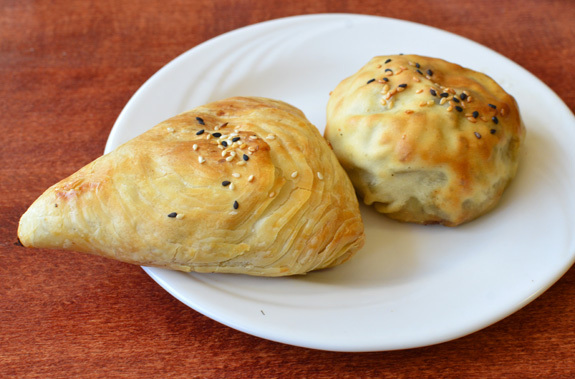 The chebureks (fried turnovers somewhat similar to Azerbaijan’s kutabs) came with various meat and vegetable fillings. 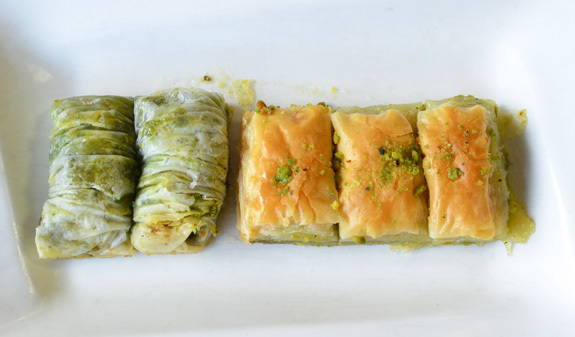 The “Special”, stuffed with finely chopped lamb, onion, dill, and parsley, was quite good, with thin, crispy dough just out of the deep-fryer and a fair amount of filling — although there’s never a ton in a cheburek. Many of the other so-called dough products we tried turned out to be extremely similar. 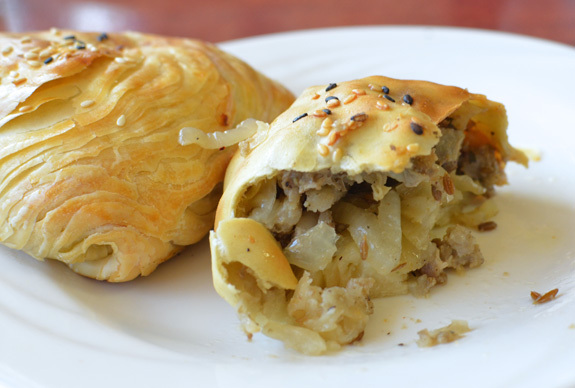 The triangular samsa was made of some kind of puff pastry, and the goshtgizhda (called gushtkiyda in some cookbooks) was a round shell of hard, crispy dough, but the meat filling remained the same: finely chopped lamb, lots of onion, and cumin seeds. Even the samsa with ribs seemed to be little more than a normal meat samsa with a bone sticking out of it. This is something you might want to keep in mind when placing your order: if you want some actual variety, consider the potato and pumpkin samsas. The minced meat itself was quite good, if you don’t mind the onion. It had just the right amount of fat, and was fairly tender, save for the odd tougher chunk here and there. 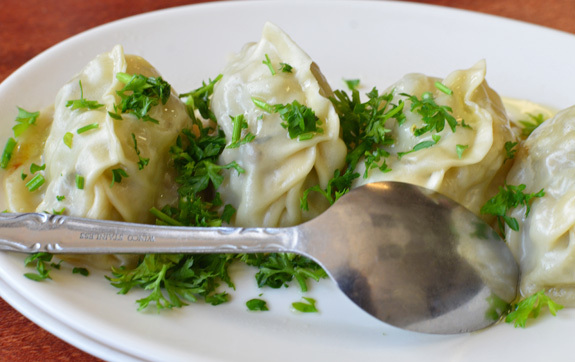 The manty (steamed dumplings) had still the same filling, and were topped with parsley. The plov was a classic affair, not too greasy: carrots, onions, tender lamb chunks, and cumin seeds again (perhaps too many). Nothing fancy, but it was good. Kebab time. 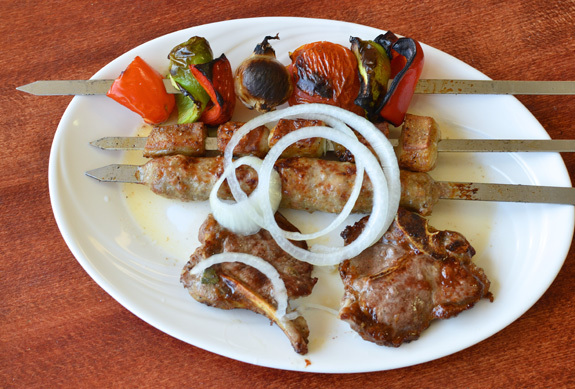 We tried a little assortment — Uzbek kebabs tend to be on the smaller side. The lyulya-kebab contained a bit too much onion and too much bread (which gave it a slightly spongy texture), but it wasn’t bad at all, very juicy and boasting a good grilled taste. The lamb loin chops had the same grilled lamb flavor, but being cut too thin and cooked well done, they ended up somewhat dry. The lamb fat is an Uzbek must. I would guess the chunks came from the ribs, not the more traditional fat tail. The nice tender pieces, well seasoned and not too big, went very well eaten together with other kebabs. The vegetable kebab skewered peppers, tomato, and onion, all good and properly cooked. 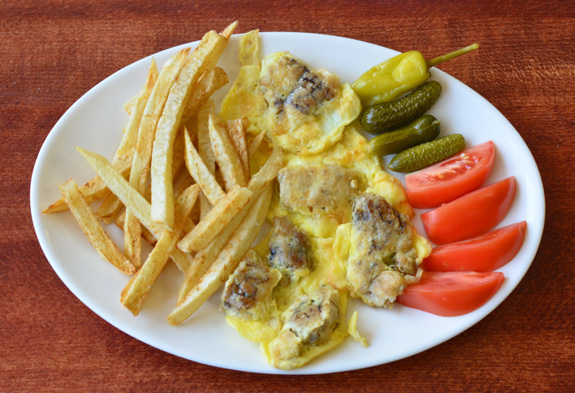 Cheburechnaya offers simple, traditional Uzbek food, most of the time well-executed. Sometimes however, more is less, as I’d rather have 7 distinctive “dough products” than 14 nearly identical ones. And please, nobody sing me the praise of their fried brains anymore! Nice review, Florian! I do need a change of scenery from Brighton Beach…since I am schleping from NJ!! 🙂 All the pics look fabulous! Have a great day! 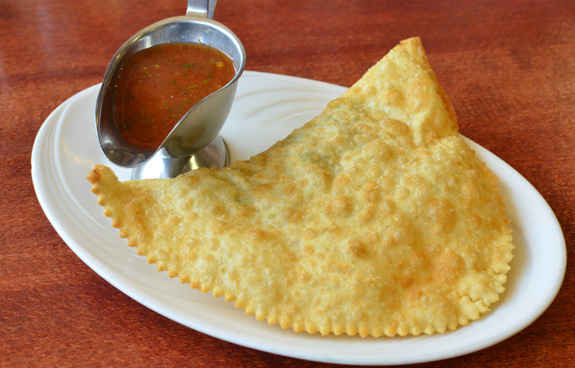 We prefer the Tandoori Bakery in Regostan having tried a few other restaurants including Cheburechnaya. You should check it out sometime. Thanks Yelena! Tandoori Bakery’s on my list, I’ll try to get there in the coming months.